"There’s a place for us, Somewhere a place for us, Peace and quiet and open air Wait for us Somewhere." I grew up watching lots of musicals, made before my time. Bye Bye Birdie was a total favorite (I've sang versions of "I Love You Conrad" to my children when they were babies) and The Sound of Music, not to mention Thoroughly Modern Millie and My Fair Lady. Long before I read Shakespeare's Romeo and Juliet in high school, I watched West Side Story with Natalie Wood as Maria. The music was so beautiful. My favorite song from the movie was the poignant "Somewhere." I knew Tony was going to get killed but still felt heartbroken when he did, and when the Sharks and the Jets walked off together, peacefully, following Maria's lead, it all seemed so utterly pointless that he died. Why couldn't they just be happy? What did all the hate accomplish? "Uh uh,"Megan squirmed in her car seat, unwilling to get out. My husband was taking our son, Alex, to get a haircut after his swimming lesson. Megan tagged along with them for swimming, while I stayed home to shower after my exercise class. Now, Mike wanted to take Alex to the barber and the plan was for Megan to stay with me. But Megan wasn't having it. "Want to come with me to the nail salon?" I finally asked after the sudden inspiration. It was an errand I wanted to run but had been putting off for lack of time. This could be the perfect solution. Megan brightened and easily agreed, coming out of her carseat. I told Megan some alternative facts about the nail salon not doing nails for children (despite the price list for children on the wall- good thing she can't read yet!) and she was quite agreeable that she would just watch me get my nails done, as long as she could pick my color. That quote opens up The One and Only Ivan, by Katherine Applegate, one of my favorite books to read aloud to my third graders. This week, I will once again introduce a group of children to Ivan, the true-ish story of a gorilla kept in a shopping mall circus for 27 years before being released to the Atlanta Zoo. Ivan's story has changed me, each time I read it. As I'm about to embark on his story once again, those words inspire new thoughts. Almost every morning, I have a little sidekick who follows me into the bathroom as I attempt to do my hair and makeup. My (closer now to four ) three year old, Megan, climbs onto the toilet and watches me as I apply lotion, foundation, mascara and more. She asks for the makeup brush and mimics me, making sweeping motions on her perfect, unblemished baby skin. She wants to know what the mascara is for and how old she has to be before she can use it, too. When I flip over my hair to blow dry my very curly dark hair, she makes the scrunching motions on her straight golden hair. Other times of the day, Megan informs me she has "important work to do" and insists I let her type on the computer. Other times of day, she assembles her "students" (every stuffed animal she can grab) and lines them up to teach them a lesson. Though she looks almost nothing like me, Megan is, in lots of ways, a mini-me, who is watching what I do and say. 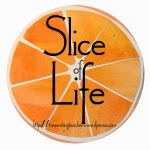 It is Monday night, which means it time for me to post my Slice of Life. This one, the first of 2017, means the first time using #SOL17. Here I sit, at the computer, and I've got NOTHING. I've thought about composing a letter to the stomach bug, which I've been narrowly escaping all break as friends and family have fallen ill. I had buckets ready to go, sure that me or my children would be victims after spending time on Christmas with family members that had the bug. So far, we've avoided it. (That noise is me furiously knocking on wood). But is a letter to a stomach virus really the way to kick off a new year? I've thought of telling a story of something that happened over the holiday break. My son, Alex, and I saw "Sing!" with my sister and nephew. On another day, my nephew's jacket mysteriously disappeared from Chuckee Cheese. These were stories I could write, but...I'm not feeling it.